If you require private channels to be programmed, please contact us on 01463229400 or detail your requirements in the Order Notes section of the checkout process. This will ensure minimal disruption in your order being processed and delivered. The HX210 6W Compact Floating Marine Handheld Transceiver features a high capacity (1850Ah) internal Lithium Ion battery, which has allowed for a smaller and more ergonomic case to be built around it. The case itself is buoyant and waterproof to 1 metre for 30 minutes and is designed to float face up if dropped overboard. There is also a water-activated strobe light on the cover, allowing the radio – or the person attached to it – to be found at night. The new model boasts one of the largest screens in its class, delivering a higher resolution display for crisp dot-matrix readouts, and a super-bright (yet dimmable) backlit LCD screen. Transmit power can be toggled between 1W, 2.5W and 6W, depending on local requirements. Floating / Submersible IPX7 Waterproof rating (3.3 feet or 1 meter for 30 minutes). All USA, International and Canadian channels. Selectable 6W / 2.5W / 1W output power. 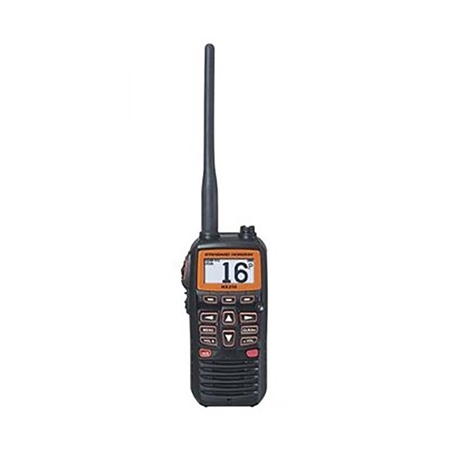 Receive WX and FM radio bands 76MHz to 108MHz. High-resolution dot matrix LCD display. E2O Easy to Operate Menu system. High capacity 1850 mAh Li-Ion battery. 12VDC and 110VAC charging cables and charging cradle included.